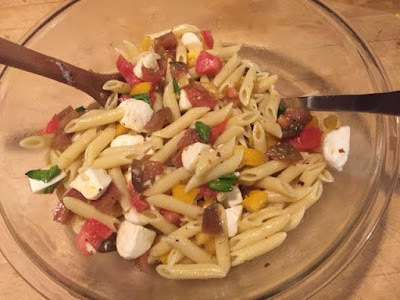 Another super-easy pasta dish. And it's light. Though there isn't any protein. 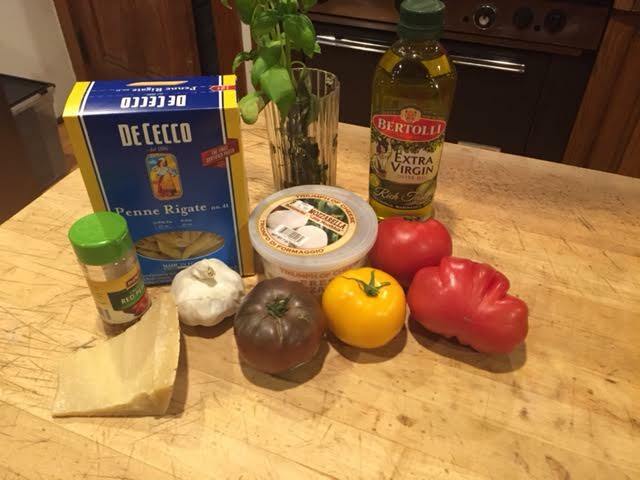 And it comes together in about 12 minutes - but that's just because it takes that long for the pasta to boil. Cook pasta following the manufacturer's instructions. You don't need a picture to show that - do you? Once pasta is cooked, drain it and add to the mixing bowl and toss seasoning with olive oil, salt and red pepper flakes. Divide into serving vessels and enjoy. If there are issues - and don't I always have them? - is that who knows what 'half a clove' of garlic is. Every clove size is different. Just tell me the minced amount in teaspoons. As it was, I ended up putting three small cloves in - but mostly because I like garlic. Leftovers were good, but you have to be careful reheating the dish. The mozzarella melted and it became like the top of a pizza. Good, but not how it was intended. And when you reheat, it worked best that you added more fresh basil after it was done heating. 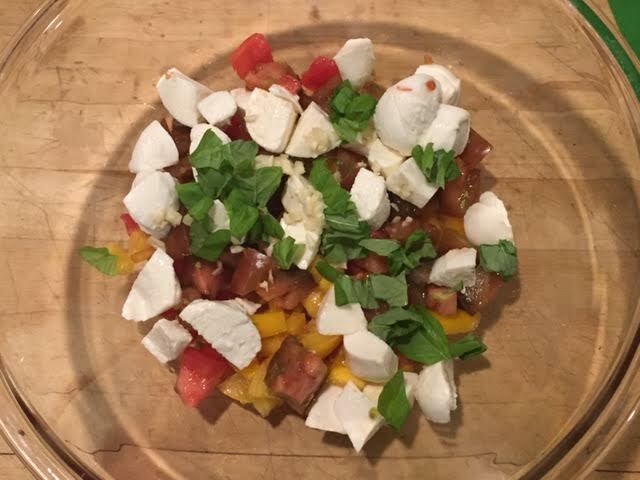 You cannot go wrong with heirloom tomatoes, basil and garlic! You always post food when I am starving and stuck in traffic on a London bus. I'm completely fine with meals that do not contain protein now and again. Sounds/looks delish! 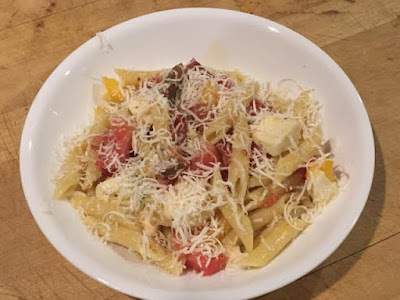 No meat protein, but probably some protein in the vital wheat gluten in the pasta and the cheese. That's one of my most loved "primo piatto" and I plan to cook it for dinner with the last heirloom tomatoes of the season. What I learned in Italy is how to handle leftover pasta, no matter what kind of sort or sugo: Mix the cold pasta with an egg and parmesan cheese (use two forks), add a bit pepper and cook it in a skillet with Oliveoil slowly and carefully. Serve lukewarm with a green salad. It's so crispy and tasty, much better then reheated pasta. Have a nice Jom Schi Schi.